Tanaka knives are high-grade hand made Japanese knives that we would be happy to compare with any knives that we sell. 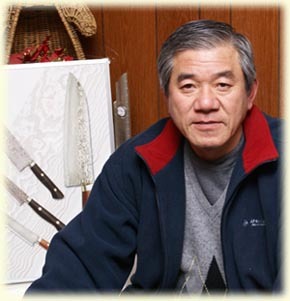 Tanaka knives are made in a small traditional work shop, by Mr. Kazuyuki Tanaka, along with his son and two other craftsmen. Each Tanaka knife is hand-forged in the traditional way, as it has been done for over a thousand years in Japan. Our Tanaka knives feature a 32 layer stainless steel Suminigashi Damascus blade with a core of R2 (powdered) steel. The Tanaka blades are acid etched to accentuate the beauty of the Suminigashi pattern by making the surface more three dimensional. To put the final touch on perfection, both the Tanaka lines have the most beautiful handles that we have seen on any Japanese knives, with a unique ergonomic design that molds to the chef's hand. One of the Tanaka lines features handles that are hand crafted from iron wood and are attached to the knives with decorative inlaid mosaic rivets. The other line feature handcrafted black micarta handles with a turquoise inlay and mosaic rivets. Each Tanaka knife comes in a wooden presentation gift box worthy of a knife of this quality. Powder metal technology is the state-of-the-art in metallurgy and is only recently finding its way into high-end knives. The Tanaka knives that we sell offer a perfect blending of traditonal manufacturing techniques with state-of-the-art powdered steel for the cutting edge. The result is a knife that is as beautiful as any made, but will hold an edge longer than any others that we have tested. An investment in Tanaka knives is one that your grandchildren will one day appreciate.